This week I want to tell you about two great websites for learning about the genealogy of every living thing on planet Earth. The first is the evogeneao Tree of Life Explorer, and it uses an incredibly ingenious design that lets you click on any currently living species and trace back to the common ancestor that humans share with it. 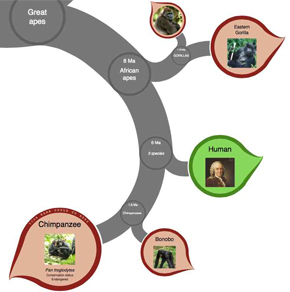 An animation then shows you where this common ancestor is located in the phylogenetic tree of all living things and tells you how many years ago this common ancestor lived. For example, if you click on the shark, you discover that our common ancestor is a species that resembled an eel; it lived 460 million years ago, which makes it our 200 million-greats grandparent! This website also offers a 5-minute introductory video explaining how the Tree of Life expresses the relationships between humans and all the other creatures now living on Earth, as well as the many others, such as the dinosaurs, that are now extinct. The graphic design of the Tree of Life Explorer also lets you very clearly visualize the five major periods of massive extinction that have marked the history of evolution. (It does not, however, clearly show the sixth, which unfortunately seems to have begun and appears to be caused by human activity. The other website depicting the phylogenetic tree of evolution is called the OneZoom Tree of Life Explorer, and it has already been online for some time (since 2012). This Tree of Life Explorer too has many features, different from the other one. In particular, it uses a fractal algorithm to represent an impressive number of species all on one page, where you can zoom in for the details. Fractals always represent the same pattern (in this case, a simple branching pattern) no matter what scale they are observed on. The authors of this site have applied this property to let you see, in increasingly fine detail, all the diverging branches of the various species that have evolved since the great division, 2.125 billion years ago, between the eukaryotes and the archaea. The advantage of this tool is that it lets you see all the major subdivisions of the tree of life in a single glance and then zoom in on the branch that interests you and discover all the finer subdivisions. For example, if you want to start by exploring all the multicellular species that have nervous systems (in other words, animals), click here.